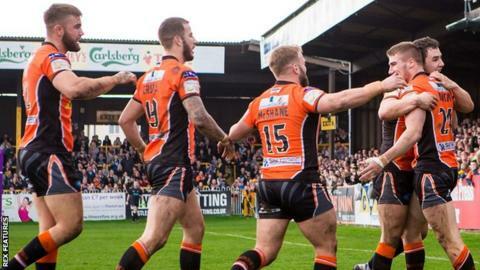 Jy Hitchcox scored three tries as Castleford overcame Super League's bottom club Huddersfield. The Giants' eighth defeat in nine outings, despite a hat-trick from Jermaine McGillvary, saw them remain two points adrift of 11th-placed Leeds. Mike McMeeken scored twice for the hosts, with Greg Minikin and Jake Webster also crossing for Castleford. Leroy Cudjoe went over on two occasions for Huddersfield, with Sam Rapira grabbing the Giants' other score. The defeat continued a miserable start to 2016 for Paul Anderson's men, who were beaten by Wigan in the play-off semi-finals last season. Castleford, who remain without a number of key first-team players through injury, climbed to seventh in the table, three points behind third-placed Widnes Vikings. "It was a crazy game. It was a typical third game of Easter. "We've generally been pretty good in this period, but I haven't been able to rotate like normal. We have 10 guys out and we lost Grant Millington early on, and it's made it hard for us. "It's a massive win. I said to (assistant) Danny Orr before the game whether we'd have enough to beat them but we did, just about. "There's a couple of clubs who've responded well to new coaches such as Wakefield and Hull KR - and the competition is real tight, so it's an important win." "Our focus has to be on dusting ourselves down and trying to make sure we win the next game. "We know this group is capable of doing some good things. It's just a case of building energy because we're robbing ourselves of it at the moment. "It's the same old story. I could sit here and repeat myself constantly. "The positive was that we scored 30-odd points but the negative was clearly the amount they got." Castleford: Hampshire; Minikin, Crooks, Webster, Hitchcox; T. Holmes, Gale; Lynch, Milner, Jewitt, McMeeken, Millington, Massey. Replacements: Cook, McShane, Maher, Boyle. Huddersfield: Brierley; McGillvary, Cudjoe, Wardle, Murphy; Brough, Connor; Rapira, Hinchcliffe, Huby, Lawrence, Ta'ai, Roberts. Replacements: Crabtree, Patrick, Mason, M. Wood.